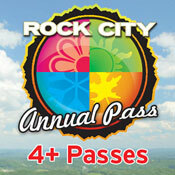 Annual passes unlimited daytime admission to either Rock City or Ruby Falls for one year! Other discounts also available to annual passholders. Please choose this option if purchasing 1-3 Total Passes. For 4 or more passes, please choose the option below. This ticket serves as a voucher for a Rock City Annual Pass. Once the voucher is redeemed at the Rock City ticket desk for an Annual Pass Card, the annual pass card will be valid for one year. Rock City is pleased to offer two annual pass options - the regular annual pass and a VIP Ultimate Pass. Regular Annual Pass includes unlimited daytime admission to Rock City, discounts on special events like the Enchanted MAiZE and Enchanted Garden of Lights, discounts on food and retail, and more! VIP Ultimate Annual Pass includes unlimited daytime admission to Rock City, unlimited visits to special events like the Enchanted MAiZE and Enchanted Garden of Lights, higher discounts on food and retail, and more. Please choose this ticket option if purchasing 4 or more Total Passes. For 1-3 passes, please choose the option above. Visit Ruby Falls as many times as you want for 1 low price!! A Ruby Falls Annual Pass costs less than the price of two 1-day tickets to Ruby Falls. Come back and visit Ruby Falls as often as you like for one year. Other benefits include: discounts on food and retail, discounts on specialty tours including the Lantern Tour and Haunted Cavern, and more! Visit www.rubyfalls.com for more details.